You can download all the Java implementations from here. This year, I will be a speaker at MAX 2008. The session title is 'Delivery of a Mission-Critical RIA for NATO' and is held on Tuesday at 4:30. Hope to see you all there. This week, while in Redlands for a holistic lab session on the Flex API for ArcGIS Server, a user showed me the following gem. 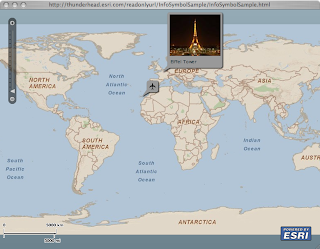 Using the new Flash Player 10 FileReference class, you can create an image snapshot of a map component and save it locally to a file, without a server side service. To compile the application using FlexBuilder, you need to adjust your compiler SDK to version 3.2. If you like FlexUnit, then you really wanna check out Fluint. It does the basic unit test assert stuff, but my favorite is the sequence testing. This is where it blows FlexUnit out of the water. Great job Mike, Jeff and Mike, you have a new convert ! "Be sure to define the module instance outside of a function, so that it is not in the function's local scope. Otherwise, the object might be garbage collected and the associated event listeners might never be invoked." And guess what ? it works! After more reading, found out that the former code was a great way to pre-load modules. Anyway, hope you find this useful and funny. And remember: When all fails, RTFM. Or should it just be RTFM - LOL! I'm looking for a fast JSON decoder in AS3, and I'm really hoping that the next Flash player will have native JSON functions like IE8. The as3 core library has a decoder. Tested it on a one megabyte JSON String and it took almost 4 seconds to decode on my MacBook Pro. Wow ! There has to be a better way. Couple of former life ago, was really into lex/yacc and flex/bison. BTW - I laughed so hard when I read the name of the first link when I googled 'lex yacc' - The generated "C" code was very fast. So one of the "modern" way to write a lexical analyzer/parser is to use ANTLR. ANTLR has an option to target ActionScript. I Found a JSON grammar reference and made simple adjustments for AS3. Ran the ANTLR Tool on the 'g' files and compiled the generated AS files into a test harness. BTW - Had to adjust by hand the generated AS3 code, as it did not compile out-of-the-box :-( I passed a set of test cases for the exception of escaped string content. Now, back to the one megabyte JSON String. It took almost 29 seconds !!!! Wow ! Thinking about it some more. It kinda make sense, as I'm evaluating the string from a generated AST. Anyway, I believe you should "publish" your successes and failures. Like usual, here is the source code. * Simple custom class with variable color property. * Bindable color property. dispatch Event.CHANGE on change. * upon the receipt of the event. * Recommended that you do this here not in the draw function. * Here we only render MapPoints. * Draw the map point. * Here we position the sprite and use raw flash graphics primitive to draw. Here is another example where I'm using Degrafa's drawing capabilities to create a simple pie chart symbol, where the wedges are proportional to the graphic attribute values. And finally, here is another example, where I'm using embedded and downloaded bitmaps. You can download the source code from here. Note that I have to set the value of left to NaN to override the default value. In addition, I'm using Degrafa to skin the border. Check out the sample here. And you can view the source code here. Note that I simplified the storage retrieval in the getTileURL function. ArcGIS places the tiles on the file system as a set of sub-directories of the form level/row/column.jpg. I decided (out of laziness :-) to keep it flat and have a set of files in the form lXrXcX.jpg. I introduced the QuantileAreaCalculator Class that intercepts the query last result and performs a quantile distribution of the features. A graphic feature is assigned to a bucket, and is assigned the symbol associated with that bucket. That last assignment forces the graphic to redraw itself. Thus the above result. The QuantileAreaCalculator numClasses property is bound to the numClasses combo box value, where upon a value change, the distribution is recalculated and the layer is auto refreshed. Download the full source code from here. Was tasked to build a Flex based 3D multi-nodal routing application for ESRI's International User Conference. Check out it here. The application enables the user to select a starting and ending room, then an optimized route is calculated using an ArcGIS GeoProcess task. The returned features are rendered in 3D and symbolized based on the floor level and the transition type, such as escalator, stairs or elevator. 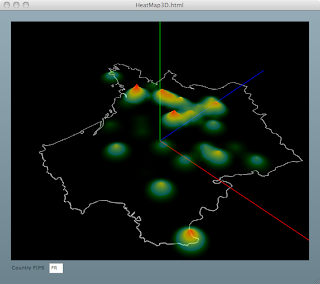 The floor and room outlines are derived from embedded shapefiles. I used Papervision3D for the the 3D rendering. Though this was my first time dabbling with Papervision, the learning curve was easy and having access to the source code made it more approachable. Just got approved to be there. Hope to connect with some of you guys ! Point locations in the new Flex API for AGS are rendered using a Symbol subclass. One of these classes is the InfoSymbol, where an info window (callout) will be displayed anchored at the point location. Developers can specify the content of the symbol as a DisplayObject sublcass. The InfoSymbol was inspired from the FIG: Callout Component. Below is a sample. Click on it to see it in action, and you can download the source code from here. This is one of my favorite usage of the API in pure MXML. I'm taking advantage of data binding to represent the output of a Query Task in graphical and textural format. 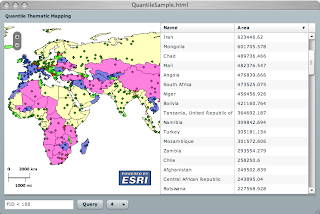 In this application, I've created a QueryTask to a specific layer (countries) in an ArcGIS service (world). The QueryTask has a Query child specifying that the geomerty of the features should be returned, in addition to all the attribute fields. The application UI consists of a side by side map and data grid, and below those is a text field to define a "where" clause, and a button to execute the query. The map has two layers, a dynamic layer to show the world and a graphic layer to show the selected countries. When a user clicks the Query button, the Query "where" attribute is populated (via binding) with the textfield content and the QueryTask is executed. Upon a successful result, the graphic layer will be populated with new graphic objects and the data grid will contain new rows. Ok gang, sorry for the long silence. We have been busy here @ ESRI with building the Flex API for ArcGIS Server. We will be announcing the public beta at the user conference this week and here is the link. Download it, try it out and give us some feedbacks. The SpringSource folks announced the beta release of an Application Platform. This is very cool, where in the past you had to have a web server to start up Spring. And if you are a big fan of OSGi and Spring-DM (like I am) you know what a pain it was to wedge all that together. And if you think about it, it was a chicken and egg problem. Well no more, this platform does it "right", where it starts the JVM, the OSGi platform (Equinox), the new Dynamic Module Kernel™ (dm-Kernel) and then the bundles. Remember back when SpringSource bought or aligned (do not remember which) with the Tomcat folks, well Tomcat is now a web bundle. This is very cool - next is to move it onto EC2. unable to resolve 'assets/cross_cursor.png' for transcoding. Here is what the code looked liked.